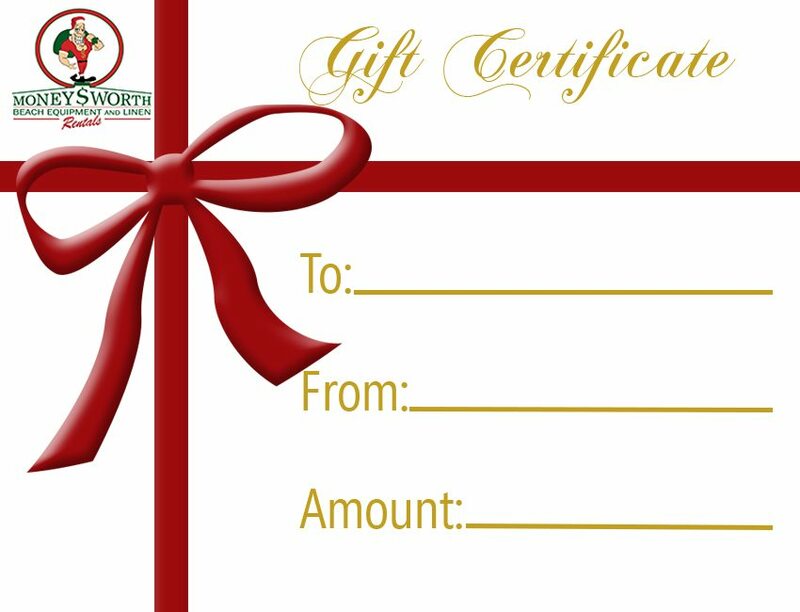 Give a Moneysworth Gift Certificate good towards any rental item in our store. If you have friends or family planning a vacation on the Outer Banks of North Carolina or Sandbridge, Virginia, then we have a perfect gift for them. Give a Gift Certificate towards any rental items in our store. Choose the dollar amount of the gift certifcate from the drop down menu below. On the check out page in the box that says “Comments” please let us know if you would like a blank gift certificate mailed or emailed to you? We can email the gift certificate directly to the person receiving the gift, please provide us with their email address, to whom it is going to and what you would like the gift certificate to say.